In California we have a process known as ballot initiatives or propositions, by which laws can be created by citizens and passed into law by votes at the polls. This November Californians are voting to require that genetically modified food be labeled as such. I firmly believe that labeling GMOs is a step in the right direction toward a more sustainable food system. This fight is a people vs. mega corporations fight. The “No” campaign is outspending the “Yes” campaign by millions of dollars. Recently the “Yes” campaign asked: What is more powerful – a million dollars or a million people? I am betting on the latter. Out here in the gardening, sustainable food/living blogosphere, I know I may be preaching to the choir, but the time is now to get involved and help California pass Proposition 37. No matter how little or much you know about GMO food, please get informed about the proposition and consider getting involved. Genetically modified organisms (GMOs), according to the Cambridge Online Dictionary, are a plant or animal whose genes have been scientifically changed. Foods are modified to resist herbicides, pests, and certain viruses, among other and expanding reasons. 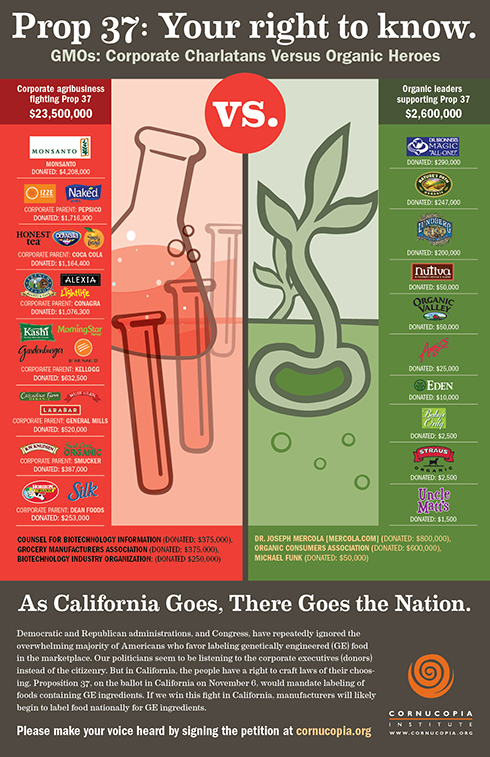 Genetically modified foods have been sold in our grocery stores since the 1990’s. If you live in the United States and you eat non-organic processed foods, such as cereals, crackers, salad dressings, etc. you are more than likely eating genetically modified soy, corn, sugar (from sugar beets), among other things. Canola oil is another large genetically engineered crop. And, for the very first time, a genetically modified sweet corn is being sold on the cob at Wal-Mart and other grocery stores. Currently a biotech company is seeking approval from the United State Food and Drug Administration (FDA) for a genetically engineered apple that does not brown when sliced. 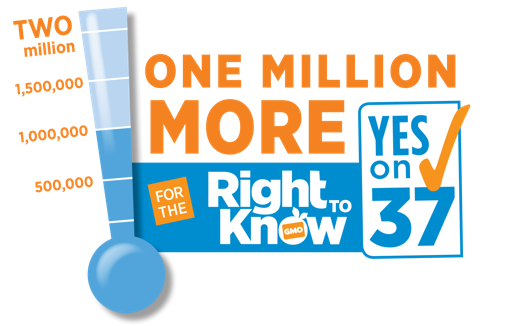 Proposition 37 maintains that consumers have the right to know if the food they are eating has been genetically modified. If passed, raw agricultural products such as sweet corn, or processed food containing one or more genetically modified ingredients would be required to be labeled as such, just as food companies are required to label fats, calories, cholesterol, etc. Genetically modified foods have entered the market with virtually no testing: The effects of human consumption of genetically modified foods have gone virtually untested. There have been no long-term human studies to determine if there are any adverse effects from eating modified foods. The FDA does not require that these foods be tested. As stated in a post on the California Right to Know blog, the sweet corn being sold this summer “….has been genetically engineered to withstand large amounts of Roundup weed-killer and also to express a pesticide, Bt toxin, within the corn itself.” I think we have the right to know if we are eating food that has been altered this way. The overuse of pesticides has created “super” weeds: A recent article published by CBS discusses the controversy of Monsanto’s new “agent orange” corn. According to the article, farmers are finding it more and more difficult to battle the weeds, as they become resistant to the herbicides currently used. This newly engineered corn is built to withstand 2, 4-D, a component of Agent Orange. What happens when this herbicide stops working? Herbicides and pesticides are harmful to farm workers, consumers, and the planet: Genetically modified crops such as corn and soy, since resistant to herbicides and pesticides allow farmers to apply these harmful chemicals in larger quantities. Exposure by farm workers and consumers is increased with each application. And, ultimately, these chemicals and their residues end up in our soil and water. Over 40 countries either have bans on or require labeling of GMO food: Currently, in the polls, Proposition 37 is winning by a 3 to 1 ratio. Consumers want their food labeled. However, the opposition, mainly pesticide manufacturers such as Monsanto and large food processors such as PepsiCo are contributing millions of dollars to defeat the labeling initiative. This blog post has the most current details. The campaign needs as many individuals and organizations as possible to get involved. Even if you don’t live in California your help is needed. You can send information to friends and family, post information on your own blog and/or social media sites, and donate to the campaign. For a great flyer with great information, click here.